Smokin’ on the water… that’s how hot these cool canoes, krazy kayaks and bodacious boats are! 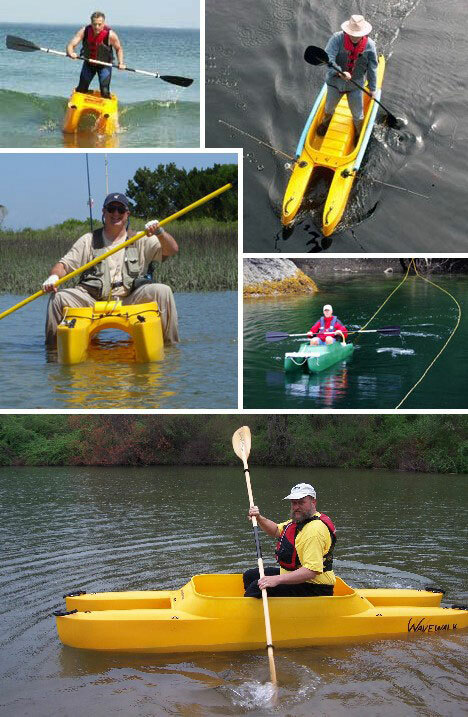 It’s amazing what a little tech know-how and a vivid imagination can do when whipping up wild watercraft. Here are 15 that’ll really float your boat. The name Folbot is familiar to most anyone who read a comic book or magazine sometime in the last 50-odd years. 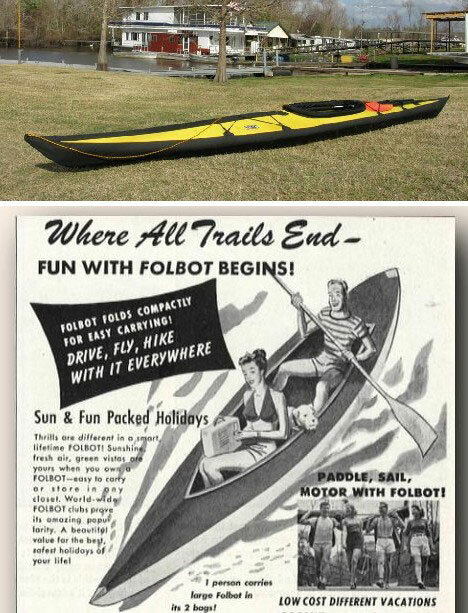 In fact, Folbot has been producing and selling their iconic folding boats and kayaks since 1933. Sturdy, lightweight and with decades of incremental improvement behind them, Folbot is a hydrodynamic success story in every way. 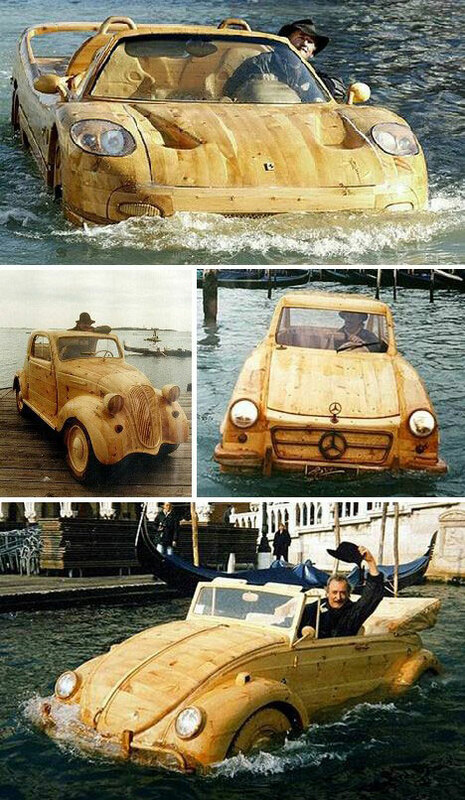 Wood was the original building material for humankind’s first boats and Shuhei Ogawara, who works in the Fukushima, Japan, city hall forestry department decided to go back to basics when designing a home-made canoe. Ogawara added an environmental twist to the concept, however, by using only discarded wooden chopsticks from the city hall cafeteria – 7,382 of them! The result is a snazzy-looking canoe 13 feet long that weighs 66 pounds. 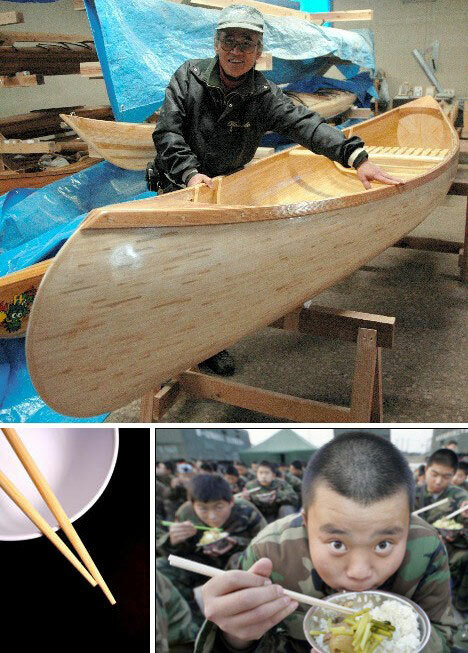 No telling if an hour after launching, Ogawara wants to build another canoe. Ever dipped a clear glass in a swimming pool? See how it virtually vanishes? 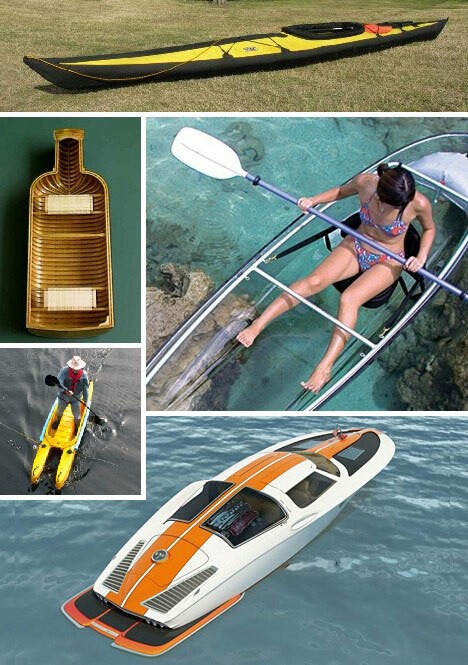 Now imagine the glass is an 11-foot boat – and you’re inside! Constructed from lightweight aluminum tubing and clear polycarbonate plastic, the $1500 Molokini is rated at 425 lbs carrying capacity. 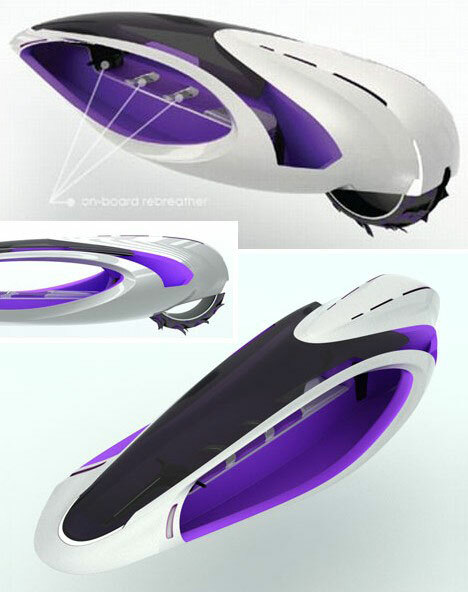 Sailing over tropical reefs in one of these must be like scuba diving without getting wet. 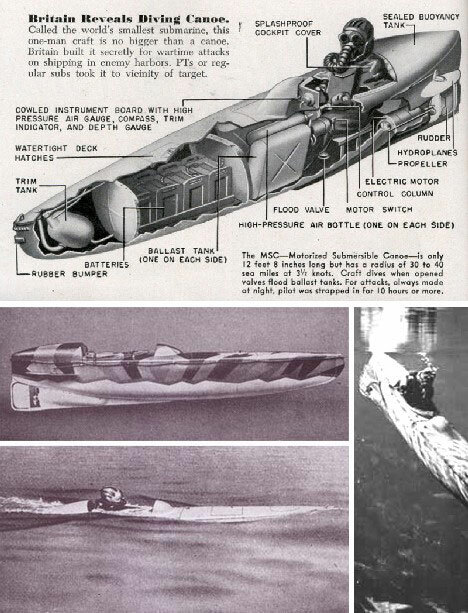 Motorised Submersible Canoes (MSC for short) were developed by Great Britain’s Royal Navy in World War II. Essentially a one-man submarine no larger than an average canoe, the so-called “Sleeping Beauties” were used in daring raids against Japanese shipping in captured ports such as Phuket, Thailand. Though the operators were equipped with scuba gear, piloting one of the battery-powered subs just beneath the ocean’s surface for up to 40 miles must have been a miserable experience. 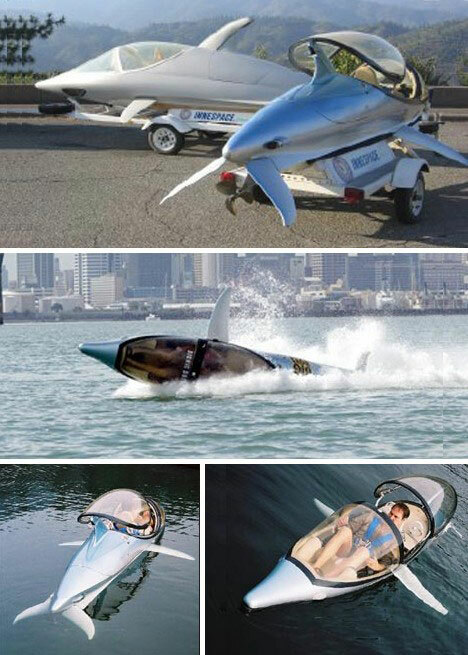 Consider the Innespace Dolphin and Seabreacher to be modern descendants of the wartime Sleeping Beauties. 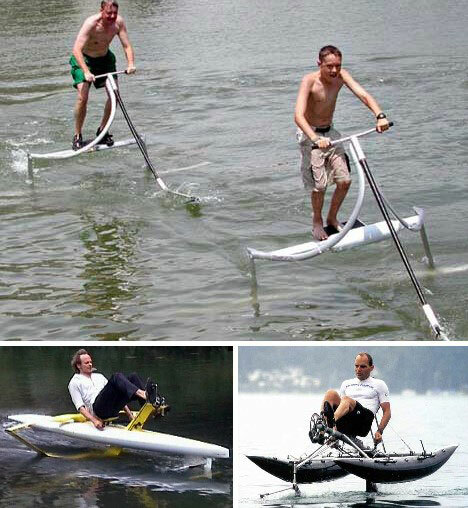 Both craft – the Dolphin is slightly smaller – are driven by a rear-mounted electric motor and can swim, leap and perform limited acrobatics like real live dolphins. One wonders what actual dolphins think of Innespace’s robo-Flippers… all this writer can think of is a certain scene from Ace Ventura: When Nature Calls. The Corvette Stingray was named after the corvette, a “a small, manoeuverable, lightly armed warship, originally smaller than a frigate and larger than a coastal patrol craft,” and the stingray, a marine vertebrate related to sharks. Now Bo Zolland has doubly returned the compliment with his stunning 1963 Chevrolet Corvette Boat Design. The boat features gullwing doors and can be ordered with a choice of engines including 496 HP or 502 HP Mercruisers, an LS-9 marine or a Volvo Penta Diesel with up to 550 HP. Seats 5 and would look fairly amazing on a trailer behind an actual ’63 Vette. Like a little air with your sea, or vice versa? You get plenty of both with the Flying Inflatable Boat, or FIB as it’s called at the company website. 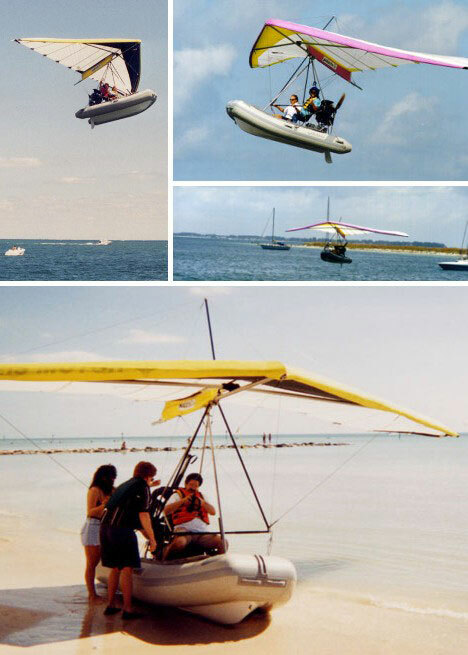 The FIB is one of those inevitable inventions – once the concept of ultralight aircraft was proven and standardized, extending the idea to create a flying boat just seems obvious. What better way to explore far-flung tropical islands, pop in to isolated fishing spots, conduct search & rescue missions or, as the company website recommends, “fly into your favorite restaurant”… which hopefully isn’t on the upper floors of a Manhattan skyscraper. 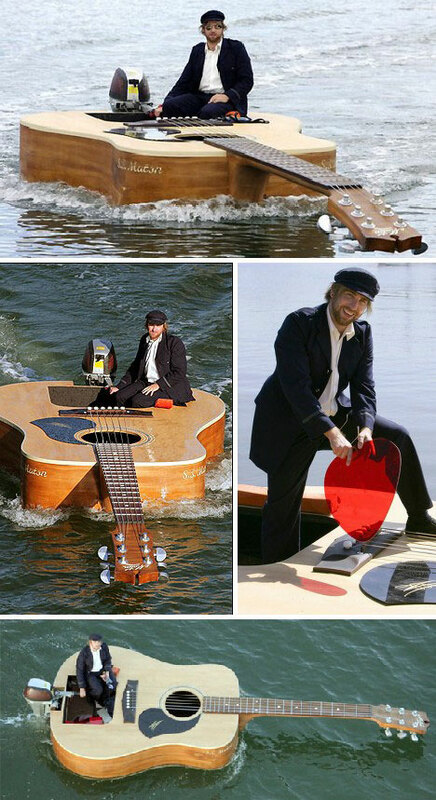 Kayaks are not normally recommended for the balance-challenged but the innovative WaveWalk kayak puts a new spin on things. 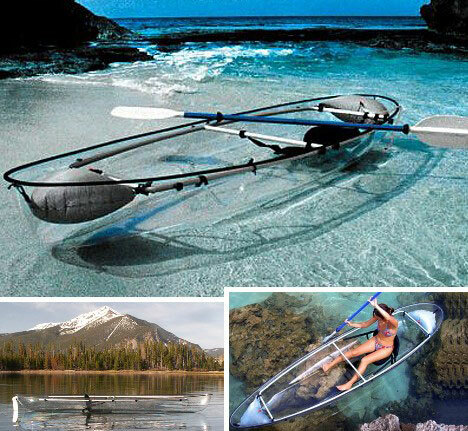 Evoking the stable design of the much-larger catamaran, WaveWalk kayaks are so stable they can be stood up in and fished from – a trick even the Eskimos did not know. 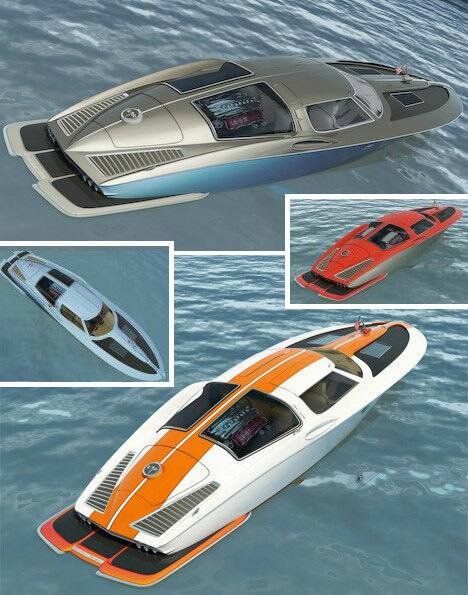 If boats can fly, cars can certainly float… Ted Kennedy may have been wrong about that but Jeff Bridges has hit the nail on the head with a series of custom carpentered car-boats. WHY he does this is unknown, though as an attention-grabber it’s hard to beat a floating Ferrari. More like a Water Strider actually, the Proteus catamaran skims across the surface of the water much like nimble insects on sun-dappled ponds – without the need for surface tension to hold it up. 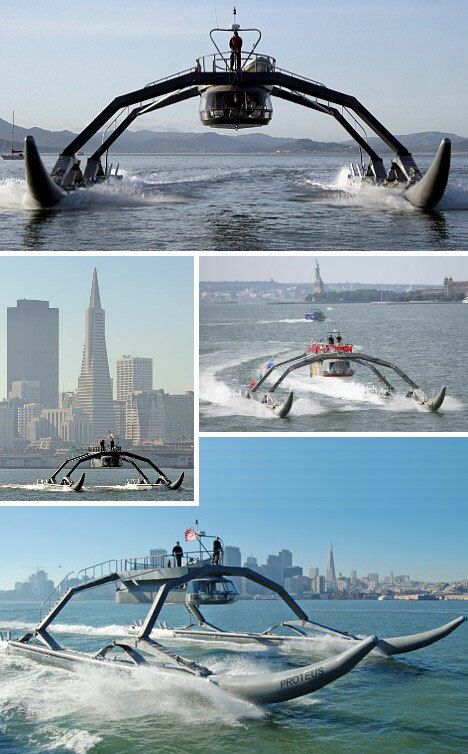 Explains Ugo Conti, co-founder of Marine Advanced Research, “Proteus is the prototype of what we hope to be a new class of water vessel – the Wave Adaptive Modular Vessels, or WAM-V’s.” Testing on San Francisco Bay should confirm whether Proteus and its ilk really do have the spidey-sense needed to cross entire oceans. Stay tuned! 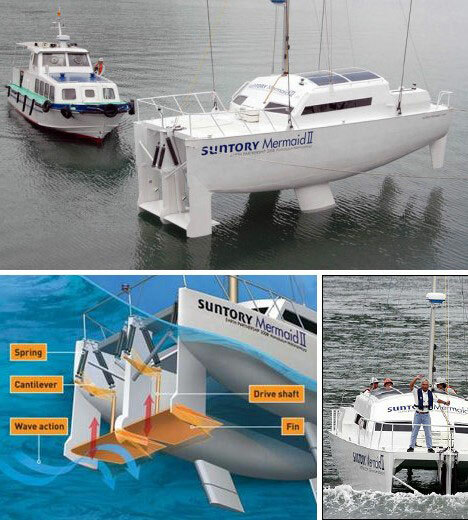 Another odd boat is the Suntory Mermaid II, a wave-powered boat… which sounds impossible, like a wind-powered airplane, but it’s the real thing! The three-tonne catamaran sailed over 4,350 miles from Hawaii to Japan in early 2008 with ocean waves being its only source of motive power. Mind you, it didn’t break any speed records but it didn’t have to – just arriving at its destination was the whole point of the exercise. The term “U-Boat” stands for unterseeboot – undersea boat; or submarine. The Ammonoq is also a U-Boat though it carries no torpedoes. Cruising at the surface it’s much like any other boat, though the smoothly curved glass top will attract second glances. The Ammonoq really comes into its own when it submerges. The crew of 3 can spend a surprising amount of time beneath the waves thanks to the onboard rebreathing unit and individual regulators. Find a pretty place to explore? break out the tanks from storage and go scuba diving. Fun in the depths – with no annoying depth charges. 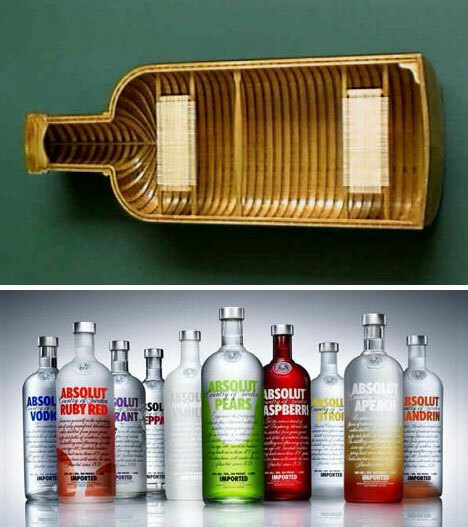 Everyone’s familiar with the long-running series of Absolut Vodka ads but this unofficial one may have floated on by. It’s the Absolut Canoe – no connection with the clear liquor but clearly inspired by it. Though only an artistic concept by The Object Works, it would be interesting to take the Absolut Canoe out for a spin… would the experience leave one shaken but not stirred?